What Type of Silver Antiques Should You Collect? Collecting silver is a fun task but you must consider that there are several types of antique silver available. Silver is a soft metal and yet very useful and valuable. We present here information about the available types of silver to help better your collection. This silver contains 99.9% of silver with 0.1% impurities. Fine silver is very sleek and has no much use except for silver investments and bullion bars. This one contains 92.5% of silver with the remaining percentage comprising other metals like copper. Because of this, sterling silver is capable of holding a particular shape for as long as allowed to if care is taken. This is evident from the available 19th-century items which are still clearly marked with the name ‘sterling’ or the figure ‘925’ on them to-date which makes them the most sought-after silver by Russian silver antiques collectors New York. When we call an item silver-plated we mean it is covered by a layer of silver. The base material in most cases is nickel. The exterior of such items is usually written “silverplate” to indicate what they are. This is a mixture of copper and silver layers. They are specifically used to bring down the cost of sterling silver appliances. If the item is sterling silver, it will remain very hot for a while. On the flipside, a plated item will cool much quickly or will not attain the water temperature. Russian antiques for sale are usually marked but you still need to be cautious. Russian silver antiques New York is delicate, malleable, and easy to tarnish. With these characteristics, you must consistently pay a close attention and take care of the silver items to ensure they survive long and their value is intact. This blog will help you get valuable tips to ensure your priceless silver possessions are always glowing. First, you need to go for a gentle polish in the market. This polish must be made for silver and not a general metal polish. Polishing is good but should only be done when it is absolutely necessary. The negative part of this process is that polish takes some parts of the metal which eventually reduces the value of the silver. This especially happens when the item is plated which exposes the base metals. You will need a case or a bag that is tarnish-proof to store your silver antique items. When you use these you will prevent the need for polishing. Acids actively cause corrosion of your vessels. They can get in touch with your silver antiques after you have eaten eggs or acidic foods. To avoid this, make sure you clean immediately after use and dry them for storage. The reasons you have decided to go into the silver antique collection is to enjoy your items (an unconventional pleasure). Use them to reduce the need for polishing. Meaning that your Russian silver Faberge New York will not just sit on the shelves - instead, it will be frequently washed after use. Exposing your items to conditions where they can be scratched, broken or corroded should be avoided by all means. You should be cautious especially when washing, storing and moving them. This is an invaluable antique silver buying guide to help you reach a conclusion on the best item you wish to collect. Russian silver antiques collectors New York will ensure you have the required knowledge so you can come up with informed decisions while buying your products. What is your taste? It would be useless to own a valuable item that you do not value or like. What is your lifestyle? You should know how often you will be using your silver. You can check on the design, the manufacturer, patterns, type and the era of the item. If your budget cannot afford an item then this will just be a wish. Sterling is usually more expensive compared to silver-plated items. If you have just started, begin with silver- plated candy dishes, buttons, salt shakers and many others which are less expensive. A Russian enamel pictorial store can show you the value attached to a given item. You should know the silver hallmarks which will help in knowing the origin of a given item and the year it was made. Look out also if the item is engraved - this will make them more valuable especially if they have a royal origin. In addition, authentication must happen and the melt value is established. You can also watch out for the market trends so that you can purchase in a season when they are cheaper from the Russian enamel pictorial store. You must learn how to identify the hallmarks to prove the authenticity of the silver you intend to buy. You can do this by comparing your choice with the hallmarks in an online encyclopedia. By doing this you will learn about the manufacturer and the date of production. This is important because you want to know what the previous auctioneers and dealers had to say about that item. Find out also if the sources are credible to confidently trust their documentation and proof. Someone must have paid for authentication if there is a document serving this purpose. Ask for that ‘someone’ and ask what warranty is extended to you to be covered in case the authenticity is erroneous. The history of the item you want to buy should be available because you need to know the provenance of it. By getting this from a Russian silver antiques New York store you will understand if there are any alterations. Are there any damages? Or has it been restored in any way? This can be even better when pictures are provided. If you are a bidder in an auction then register to do the advance bidding and benefit from it. To avoid overpaying for the silver antique, research and ensure your bid is in line with previous prices. Every sale made at the auction is final, so bid if you need it. Know about taxes, shipment, terms of payment and ask any relevant questions. The growth of silverware for the dining table took place in the early 18th century. From soup tureens to sauceboats, there were different types of silverware items that had been used for dining in the 17th and 18th Century. Here we have discussed a few different types of antique silverware used for dining. The gorgeous and awesome silver and enamel spoons are developed by Feodor Ruckert. These spoons were originally part of sets and had been broken up into their individual components over the years. Russian Silver enamel spoons from Russian silver antique store in New York exhibit rounded style knops and the spoons were turned face side down when the table was set. This is because the detail work was on the back of the bowl so that guests would see the gorgeous workmanship when they sat down for dinner. Tureens are the extremely popular items to have on the dining table during the 18th Century. They were heavily ornamented and used as the centerpiece for the table. They come with a classic oval, rounded form, gadroon decorated borders and a grand domed cover supported by four cast volute scrolling feet. Some of these items even have an engraved coat of arms. Sauceboats were another dominant item at the dining table and were oval shaped with a single lip and one handle. They have round base followed through on to various items of silver from jugs to teapots. Salvers during the 18th century were circular, square or rectangular. Salvers were raised on a central foot or three or four supports. Some of these items have cut card work on the base and around the foot. This makes these pieces more desirable and attractive. Talk to your Russian antique dealers in New York to find the best antique silverware that were used for dining in the 18th century. While the jeweled Easter eggs from Faberge is very famous, they are only a part of the huge artistic works crafted by the legend. Faberge was quite successful in transforming everyday objects into amazing works of art, from clocks to cigarette cases. His unique goldsmithing and enameling techniques made his works quite famous all over the world. Several people began to imitate the success and works of Faberge, thus leading to the reproduction of many fake pieces offered through dealers and auction houses. To ensure that you are purchasing an authentic piece, keep tabs on the quality of enameling, the design and the crispness of chasing. Faberge plays a great role bringing several enameling techniques back to life and even widened the possibilities of design. To be precise, Faberge invented over 145 new shades of enameling. Enamels were used to be created by layering it with different colors. While looking at the works of Faberge, pay attention to the number of layers of the enamel. The polish is usually smooth, with little to no flaws or bubbles in the glass. Most jewelry boxes were made using Holly wood, and lined with velvet and cream silk. Around 500 craftsmen were employed by Faberge for the purpose. The works of Faberge are over 100 years old, and find immense value today. Visit your nearest trustworthy Russian silver antique store in New York today and explore the priceless collection of Faberge and Feodor Ruckert today! If you have found a seller who is offering Russian silver antiques, the first thing that you need to do is to investigate their business, and also know the other items available for sale. If the seller has several pieces of the same item, you can be sure that it is not authentic. Russian silver antiques are rare and one of a kind, so buying in bulk is not possible. Before purchasing the piece, get in touch with the seller and ask questions about it. You can probably ask how the item came to the seller’s possession. They usually procure items through their own process of antique hunting. An honest antique seller will let you know where they obtained the item, as well as the date and the condition of the item at the time of acquiring it. Do thorough research online. Russian antiques for sale come with a mark of authenticity, with which you can make sure that you are investing in the right item. Lookout for these signs when you are exploring antique items in the store. Deal with the most reputable and reliable antique dealers who have a great experience in collecting authentic antique pieces. Trustworthy antique dealers will also offer you a lifetime guarantee of authenticity. Is this antique an original or reproduction? Is it over 100 years old? What are the best antiques to buy? Here we have listed some useful tips that help you make the wisest decision on purchasing the right antiques. No matter what type of antique material you are shopping for, understanding the quality and price of the antique is essential. Don’t be afraid to ask the dealer questions regarding the item’s history. Dealers are the best resource you have in finding out more about the item and are always happy to educate novice Russian silver antiques collectors in New York. Buy antique items that that appeals to you! What’s the point of having an antique in your home that doesn’t hold your interest or you don’t have a passion for? So, only buy antiques that you love, and you will never be disappointed with your purchase. Before investing your money into a rare piece, take your time to investigate the item. Pick the item, look underneath it, check for cracks or damages, study the back and sides and feel the touch to uncover any signs of damage or repair. Inquire about the condition of the item with the dealer even if the item appears to be in mint condition. While choosing a dealer for your business, find out how long they have been in the business. Only the reliable Russian antique dealers in New York help you to find a quality item and justify the money you pay. The first model of Kovsh is believed to have originated during the middle of the 14th century. The name Kovsh originated at this time. They are better called as ‘Kovshi’ due to its variation in size, uses, and origin. The small sized, individual Kovsh is used to pour out a drink from a larger one. The smaller Kovsh is usually kept by the side of the larger Kovshi for presentation purpose. Zhalovannye is a popular form of Kovshi that was used during the 18th century. However, Zhalovannye over time were less used as a vessel and more frequently used for decorative purposes. They were also often used as gifts from Tsars to the supporters of the Empire. The name of the recipient would often be engraved on the side for this purpose. A beautiful Kovshi decorated with pearls and sapphires was gifted by Tsar Peter I to Frederick Augustus I. Even though this Russian antique material witnessed losing its popularity during the mid-19th century, it started gaining fame yet again around the 19th century as an ornamental object. This antique piece available from Russian antique dealers in New York finds great value today and will definitely be a great addition to your antique collection. When it comes to high-end antiques, they demand a certain sense of understanding to truly gain value and appreciation for both their worth and their sentiment. Buying the right piece of antique can be a challenging task even for the savviest antique buyers. If you are a savvy buyer of Russian silver antiques in New York, here are a few tips to consider to ease your antique buying journey. Finding a responsible and reputable seller is the fundamental key to making an antique purchase. Conduct simple research to find the best antique sellers who support you in answering any questions you may have related to high-end antiques. Most of the high-end antiques are expensive; hence you should learn how to negotiate to get favorable discounts. Did you know showing courtesy as you negotiate price can help you achieve 10 or even up to 15 percent off the original ticketed price? Sales negotiation with respect and confidence means great discounts and enhancement in the buyer-seller relationship. In this competitive world, reproductions have been introduced into the mix of high-end antiques to gain more profit. With the right research and asking right questions, you can easily detect reproductions from genuine antiques. Search for labels, stamps and other manufacturing tags that inform you when and where the particular piece was made. By strengthening your negotiation skills and nurturing a strong relationship with the sellers, you can gain more experience in handling high-end antiques. Visit the Russian silver antique store in New York now to find more. Back in 2016, New York Post featured a story that forewarned many avid antique collectors about fake Russian collectibles. The news features a Miami couple who filed a suit against a New York art and antique dealer accusing him of selling them a fake Fabergé egg and other Russian collectibles for $400,000. 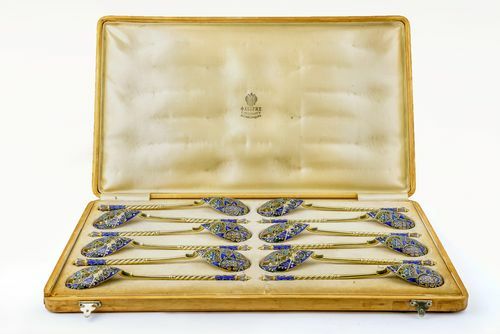 The dealer told them that the $2,600 Plique-A-Jour spoon and $33,600 Cloisonne enamel tea set they bought were over 100 years old and had been used by Russian Czars. Many such dealings make Russian silver antiques collectors in New York worry over fake Faberge antiques. Recognizing antique fakes is important to choose the right one, and avoid spending your hard-earned money on a fake antique. When buying a Faberge Antique, you must be familiar with its look and feel. Gander and touch as many Fabergé pieces as you can to detect the fake ones. When you allow pieces to talk to you, then detecting a fake one is not as difficult as many people think. Make sure to read the description that comes along with the piece to ward off any suspicion. Beware, fakes feel heavy in comparison to the real ones. The obvious clue in a fake Fabergé antique is it has sharp or rough edges. Evaluate the antique item from any store according to its age, rarity, and desirability. Check the patina. A true patina has a smooth variable surface, and the finish looks too perfect. Above all, consider the price to find the authenticity of the piece. The pieces with high price have no guarantee of authenticity whereas a Russian silver Faberge in New York with super-low price is usually good to be true. In today’s world, there is a rising trend for all things vintage in interiors. Our society was once behind the most modern, cutting-edge and exclusive designs for the home. But, now it has taken a step back to embrace an older, more experienced and more mature version of themselves. This has ushered the desire to fill their homes with unique antique pieces that have stood the test of time and have a story to tell. Adding antiques to a home décor adds beauty and ignites liveliness, only when it is displayed wisely. Here are a few different ideas to successfully decorate your home with antiques. Whether you have gathered a striking collection Russian silver flatware or Russian enamel pictorial in New York, group them on a wall or shelf to make a great impact than scattering them about a room. To make the display more interesting, segregate them according to the size and shape of objects. Do you think that displaying items in a group would make them visually lost in the shuffle? Then, you are wrong! Arranging like pieces together encourages the eye to take note of the variations in each piece and note the differences in the artistry and techniques. To embellish a room with a piece that stands out, try adding interesting Russian silver antiques in New York and collectibles to modern décor. Also, edit the display by color, theme, and material for more fun and rustic look. In addition to these, you can also transform a bare wall into a gallery space by adding wall arts such as Russian enamel pictorial, comic, or print. Also, put your display on the overlooked surfaces of your homes such as the edge of a staircase, the top of a wardrobe or bookcase and more. Russian silver antiques in New York are the very precious and beautiful collectibles that can add a touch of elegance to any space. These beautiful collectibles also tarnish, scratch and stain easily since they are very soft and fragile. Many avid antique collectors find it difficult to clean their antiques due to the fear of damaging them. Many Russian antique dealers in New York stress on regular and gentle dusting rather than infrequent, over-zealous cleaning. 'Harring' with your breath and rubbing with a clean cloth is sufficient if the item is too tarnished. This action can remove dust and minor marks such as light fingerprints. For better results, you can also use a clean, cotton cloth or feather duster. Invest in specialized cleaning cloths specifically designed for cleaning antiques and storage bags to protect your treasured item and reduce tarnishing. Using silver flatware regularly shows less tarnish, and they develop ‘patina’ slowly. This patina is known only to enhance the beauty of the antique piece. If you are using antique flatware regularly, be sure to clean them right after the usage especially after contact with any acidic or corrosive foods. Also, make sure that you don’t soak antique silver flatware overnight because extended immersion can damage the metal. Wash flatware using hot water and clean crevices with the use of an old toothbrush for better results. Also, avoid putting stainless steel and silver antiques in the same basket because the direct contact between these materials can cause severe damage to the silver antiques. Use a soft cotton cloth to dry the flatware and avoid spotting on the pieces.Now, put these tips to good use when cleaning your antique silver flatware bought from Russian silver antique store in New York to achieve the desired results. Hi readers! I won’t have penned this blog if I haven’t visited one of my friends in New York, who has an unconventional hobby of collecting antiques. His collections of antiques are priceless and have acquired his best collectibles from a Russian silver antique store New York. My friend always used to say, “A country's true history and identity lie in the everyday articles its people use.” He started collecting antique chairs because it reminded him of growing up as a child in the South. So, this pushed me to explore more of the reasons why people collect antiques, and some are avid antique collectors. Some people collect antiques because those items hold sentimental value. Some people hold on to antique items that are passed on to them by their family for three generations or more because of their sentimental value. Many people buy antiques because they enjoy restoring antique pieces and selling them to people. For some collectors, this is not about the money but an unconventional pleasure. I have come across some people who because they enjoy restoring antique pieces and selling them to people. The quest for finding a certain item pushes some people to go in search of the particular item. These collectors experience a certain level of excitement and enjoy visiting stores or antique shops all over the country. Collecting antiques is a hobby for some people and enjoy doing this in their free time. And the interesting thing is, many people go window shopping to see what type of antiques is offered in different stores or countries. People who constantly look for unique items to decorate their homes, antiques are a boon. Antique pieces such as Russian silver antiques and Russian enamel pictorial in New York are the perfect additions to any home decoration. Looking to buy or collect antiques? Visit https://russiansilverantiques.com/ now. To buy antiques, you don’t have to be an experienced antique dealer. If you know what you are looking for and use the right approaches, you can find great bargains easily. From online internet auctions to local auction houses, the buyers have a multitude of ways to buy antiques. Here we have listed a few tips and tricks to buy antiques from a Russian silver antique store in New York like a pro. The golden rule while buying antiques is “Only buy things you like.” Buying the antiques. There is nothing worse than having an antique on your shelf that does not hold your interest. Buying an antique that is out of your interest means that you are not going to invest your time in discovering any hidden qualities. Buying antiques from local county showground or exhibition hall is expensive compared to buying from local antique dealers. The best antique one should invest in are antiques you like, the one you wish to keep for a life-term, or antiques that are in vogue or fashionable. No matter where your buy antiques from, always ask for discounts. Some professional dealers mark discount codes on the item and this will tell them exactly how low they can go. Avoid offering cash in advance before buying antiques. Pay only after agreeing on a price for paying by cheque or credit card. Whether you are paying by cash or credit card, always get a receipt and make sure it lists the items age, the material, any damage or restoration and its value. Before deciding on to buy antiques, Increase your knowledge about auction procedures and become an auction bargain hunter. So, you can end up in buying the right item at the right price from reputable Russian antique dealers in New York.